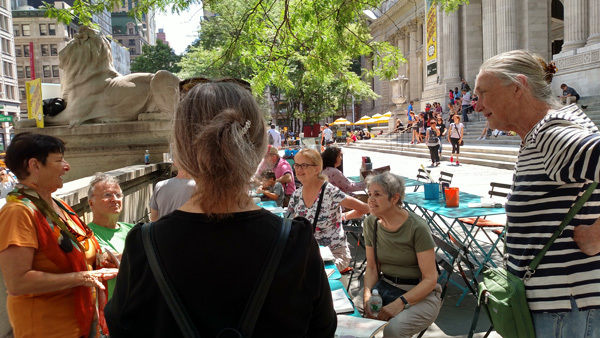 The New York City Urban Sketchers met this week on the plaza in front of the New York Public Library on 5th Avenue. 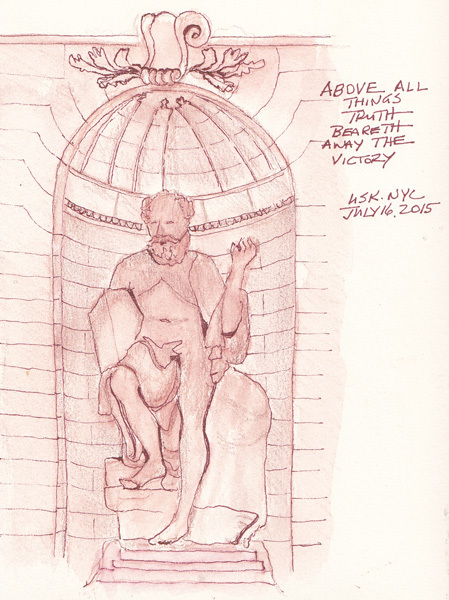 The overall plan was to sketch the Truth and Beauty sculptures and/or the Lions Patience and Fortitude. 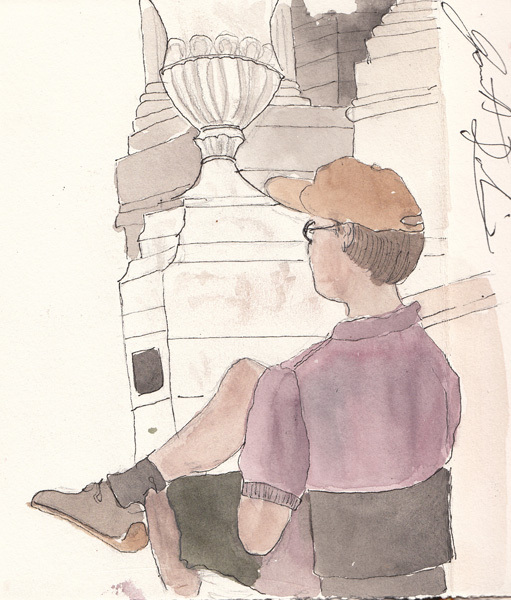 It was a gorgeous day and I sat on one of the park chairs and sketched Truth, followed by a drawing of the man sitting all afternoon at a small table in front of me. He said he is Garrett Buhl Robinson, an author who is selling his published books and passing out information about a musical that he wrote that will open in the Fall. Our weekday NYC Urban Sketchers Group. Raylie (on the left) and 3 others from the NYC Group are headed off this week to Singapore for the annual Worldwide Urban Sketchers Symposium. 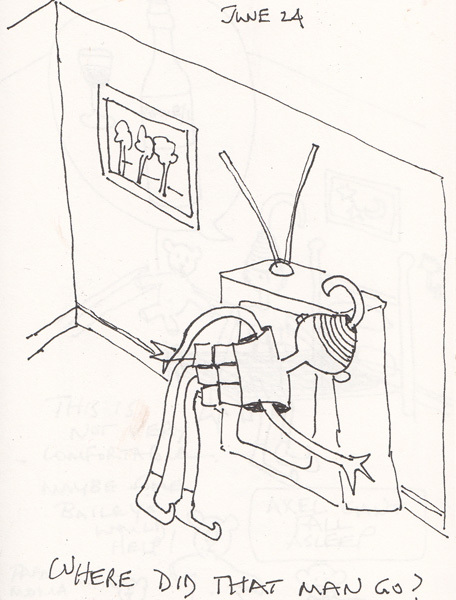 July 14th was the last day of the 100 Day Project Challenge, and I celebrated with a final drawing of Alex and Alice. 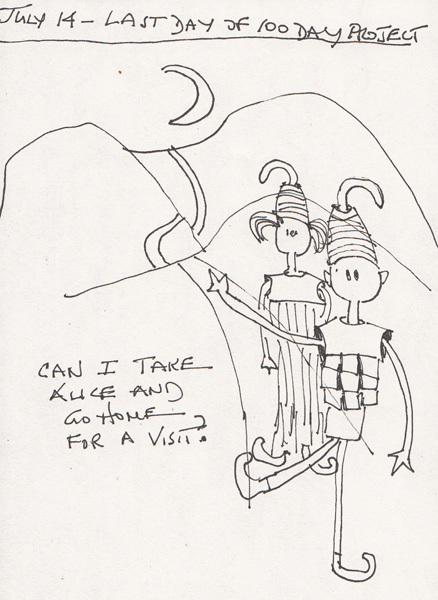 The caption says "Can I take Alice and go home for a visit?" I asked my 5 year old Grandson Zach for a backstory when he was here this past weekend. Axel and Alice are from the Moon, and their heads are shaped like that because they were both born during a crescent Moon. He says they were playing in Axel's Mother's spaceship and accidentally started it! 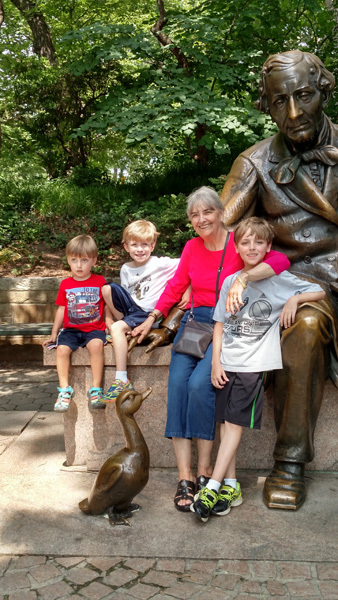 Our oldest son's 3 boys spent the weekend with us, and we all went to the Toy Boat Pond. 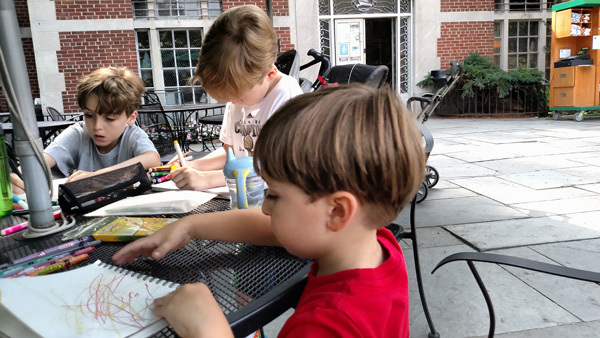 They wanted to bring their sketchbooks and a variety of crayons and markers, and we all sketched while Grandpa read the newspaper while drinking his coffee. 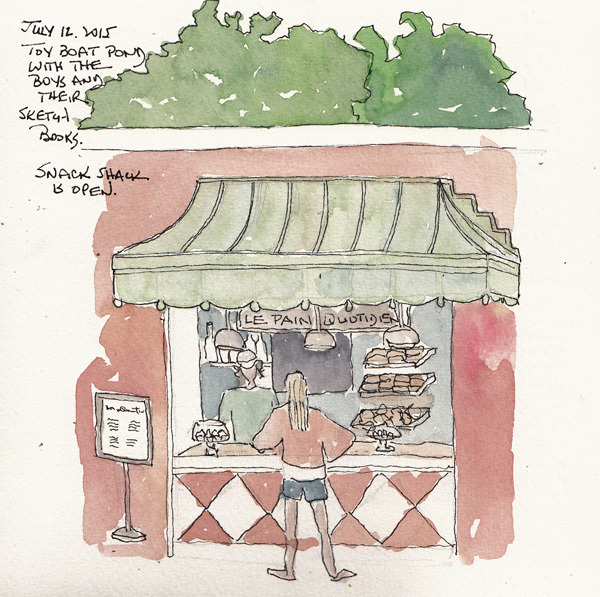 I always remember the instruction "just paint what you can see," so I painted the Le Pain Quotidien Snack Bar. 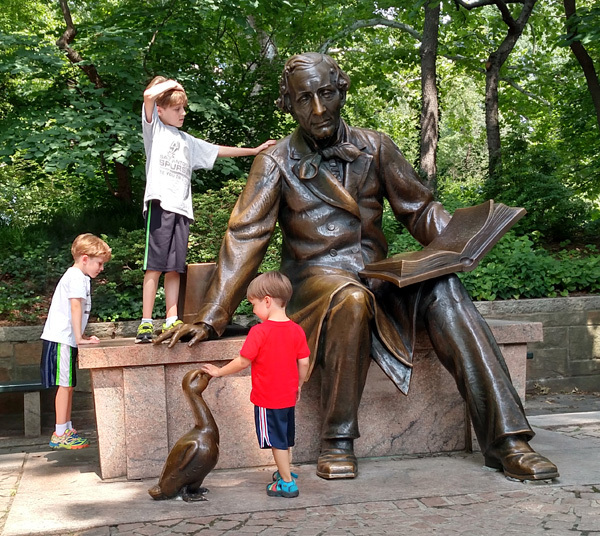 After sketching, we walked around the pond to the Hans Christian Anderson statue which is the site for Story Book reading for children in the Park. You can see the Patio Café where we sketched on the far side of the pond. All children LOVE the Ugly Duckling! 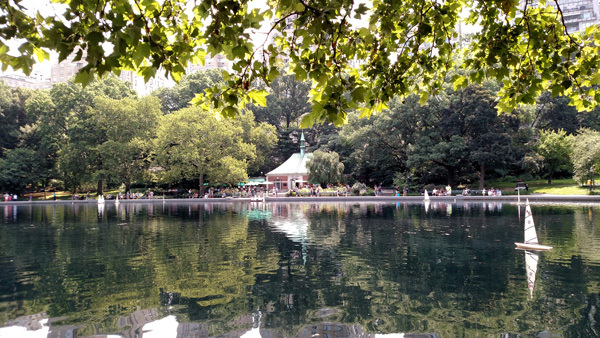 We love to go the Conservatory Water Café in Central Park on weekend mornings. 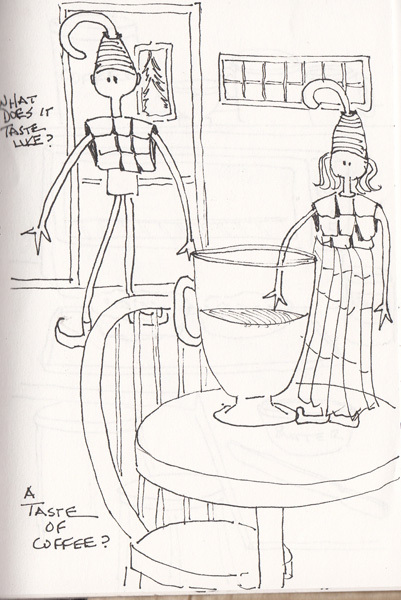 It is possible to linger over coffee while drawing, reading, and listening to nearby conversations. And the view over the boat pond is terrific. When we arrived last week there were ducks in the pond and a cormorant who was taking deep dives as he swam the length of the pond. 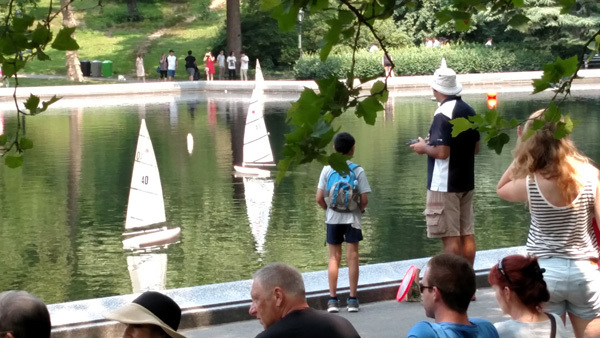 To us, it is always referred to as the Boat Pond, because of the remote control sailboats that can be rented. 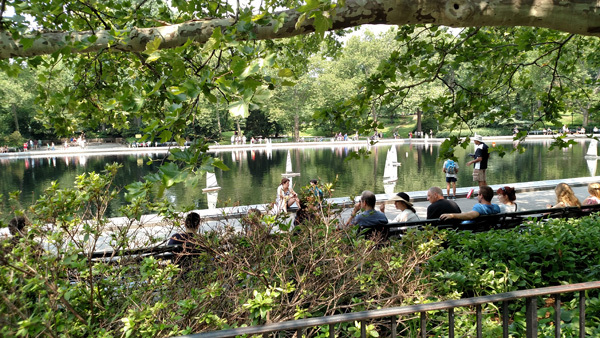 Aficianados also race their boats on Saturday mornings, just as the Storytelling session across the pond at the Hans Christian Anderson sculpture begins. 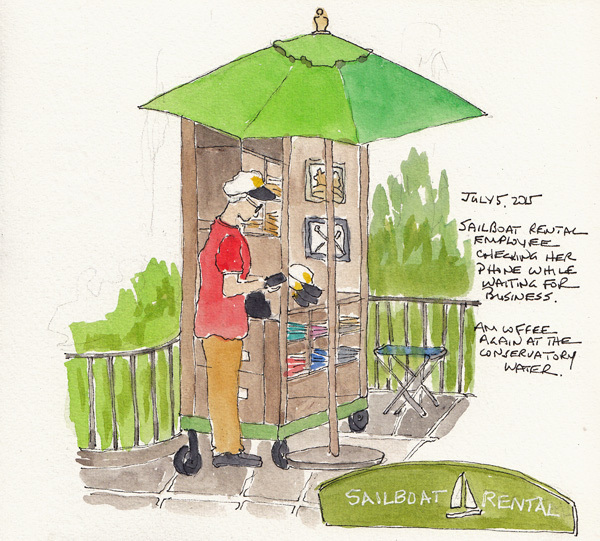 Boat Rental: Last weekend I sketched the lady in charge of boat rentals as she was checking her phone while waiting for customers for the rental boats and the T-shirts for sale. There were lots of flowers blooming around the café, and lots of bees on all of them. 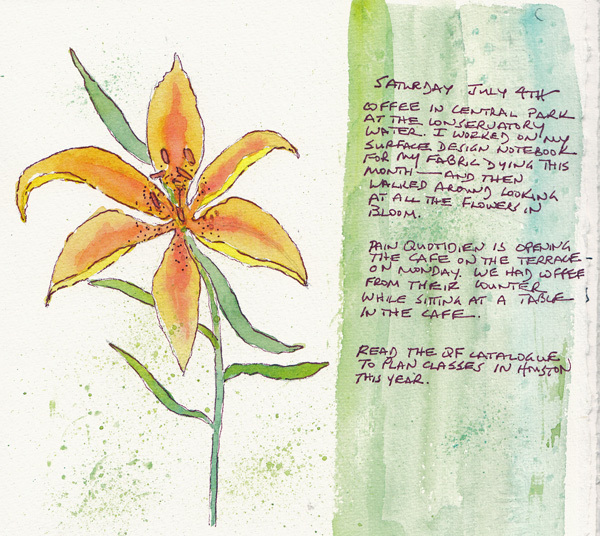 I sketched the day lily and then painted it back at our table, trying to capture the brilliant yellow and orange coloration. 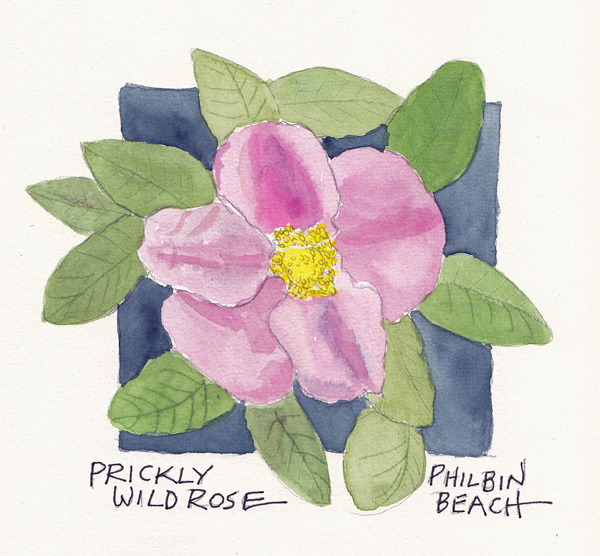 This week I also finally had time to paint the Beach Pickly Rose from photos I took at our June beach vacations. Only 8 more days in the online 100 Day Project (https://thegreatdiscontent.com/100days), and although I draw other things from my imagination for this Challenge", Axel is my favorite subject. His character developed during a "drawing with a child" homework assignment in Jonathan Twingley's week of Sketchbook Skool, and I've surprised myself that I am enjoying this pure fantasy drawing so much. There are days when I feel as if my imagination is totally empty and then I start thinking about Axel and a drawing emerges. Here are the most recent 4. My oldest son's 3 boys are spending the night with us this weekend, and I think Zach and I should begin to create Axel's story, since it was Zach who did the drawing I combined with mine when Axel first appeared. Where Did That Man Go? Can She Be My Friend? A Taste of Coffee: What Does It Taste Like? 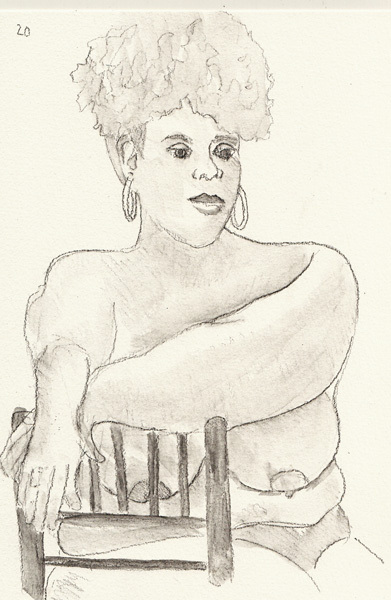 I am back to figure drawing and my last two models represent the extremes in body type. 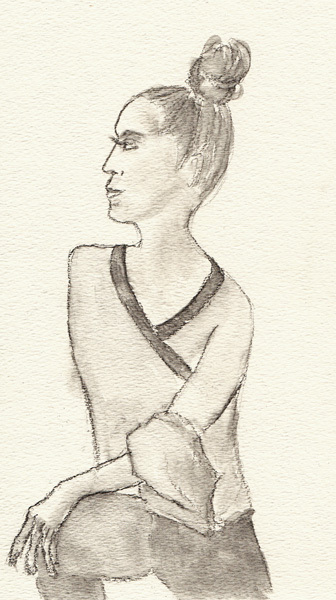 Rebecca, a model at Battery Park outdoor drawing, is extremely thin and has very long arms and legs. 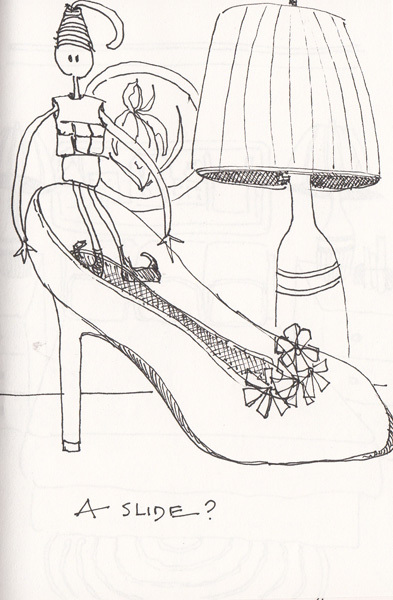 Tangerine, the model at Society of Illustrators, is massively obese. 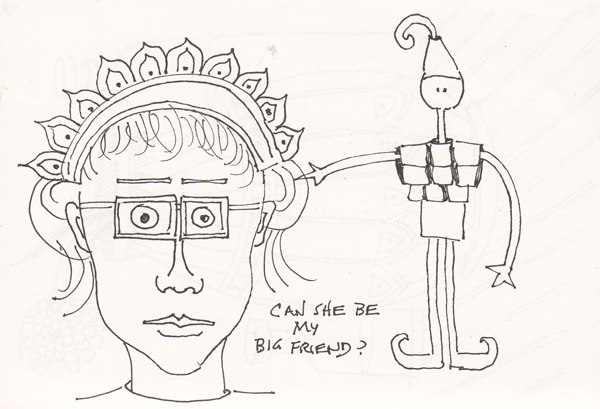 I've drawn both of them before, but rarely so close together. 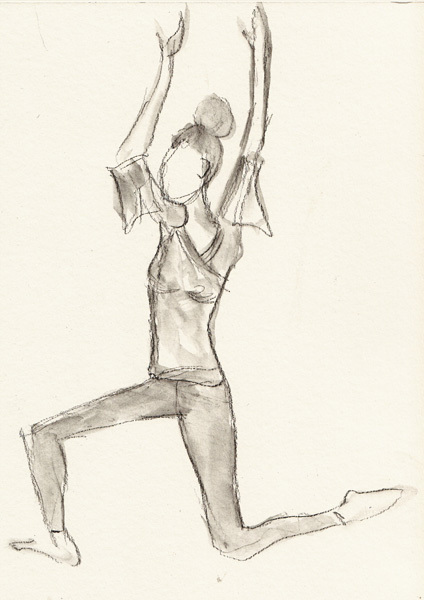 There are two 5 minute poses and a 20 minute pose of Rebecca and a 10 and 20 minute pose of Tangerine. I sketched them with a General Sketch and Wash pencil and shading was done with my waterbrush and clear water.